home / Multimedia / The Holy Land in news / Syria. Thousands flee Aleppo offensive. The Pope’s new call ..
Syria. Thousands flee Aleppo offensive. The Pope’s new call for peace. I hope that, with generous solidarity, they are lent the necessary help to ensure their survival and dignity and I appeal to the international community to not save any effort to urgently bring to the negotiating table, the parties. Only a political solution of the conflict will be able to guarantee a future of reconciliation and peace in that beloved and martyred country”. During the Angelus Pope Francis calls for peace in Syria once more. The country is now experiencing a new wave of violence. Meanwhile Turkey says that the frontier remains shut, although there are thousands of Syrian refugees massing up at its borders. 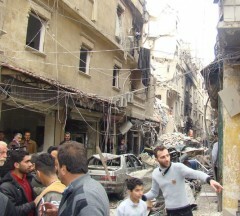 They are fleeing a Syrian government offensive on rebel-held positions near the northern city of Aleppo. In the past few days, the Syrian army – backed by Russian air strikes – has made a series of gains around Syria’s largest city. “Most of the families no longer have a place to stay or to go to” says Father Ibrhaim, pearson of Aleppo. “They don’t have houses anymore, while the few remaining houses are without windows and doors. There are different levels of damage, but the worst part is the people’s loss of hope. People don’t know what to do anymore”. 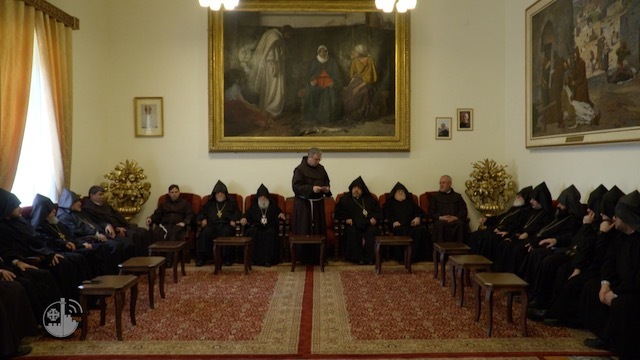 Amidst this new wave of violence the villages of the Saint Paul Region where the Friars of the Custody of the Holy Land live, “have become a sort of symbol for the Syrian Christians”, says Father Pierbattista Pizzaballa, Custos of the Holy Land. “Our presence gives hope and courage to all the other communities”. For this reason a new Friar, Father Louay Bhsarat, will join the community in Syria, to continue that “Christian witness which is needed today”. “I invite everyone to pray for him” the Custos said “as well as for his parishioners, for all the Friars and the Syrian population. I hope this war will soon come to an end”. Help the Franciscan Communities in Syria!